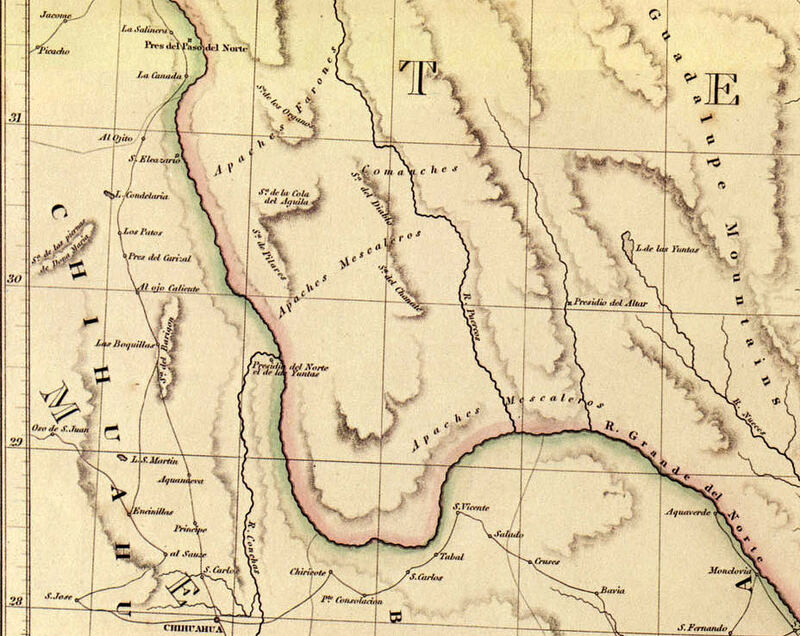 Map of the Texas-Mexico Border in 1841 detailing Presidio del Norte and Native American territories. Courtesy of Texas Beyond History. Image available on the Internet and included in accordance with Title 17 U.S.C. Section 107. TORREY, DAVID KILBURN (1815–1849). David K. Torrey, pioneer trader, the oldest son of Jacob N. and Laura (Kilburn) Torrey, was born in Ashford, Connecticut, on September 6, 1815, and came to Texas in 1839 to join his brother, John F. Torrey. In Houston David met and subsequently became closely associated with Sam Houston in political, business, and Indian affairs. Before his death at age thirty-four Torrey played a vital role in President Houston's policy of peace, friendship, and commerce with the Texas Indians. David became a partner with John and later with his brother Thomas S. Torrey in the merchandising firm called John F. Torrey and Brothers. The firm dealt extensively in the Indian trade, and David Torrey's duties included establishing the Torrey trading houses along the Indian frontier and making buying trips back east to purchase goods for the Indian trade. The Torrey trading houses served as meeting places for red men and white men and drew immigration farther west all along the frontier. The Torreys established trading houses on the Bosque River and at Austin, San Antonio, New Braunfels, and Fredericksburg. Branch stores were opened on the Navasota River and, at Sam Houston's request, at the falls of the Brazos River. George Barnard bought the Tehuacana or Brazos post in 1848, and the Torrey brothers moved west. David and John joined a party of about 100 men led by ranger captain John C. Hays to approach Indians in the Trans-Pecos area, after which the Torreys intended to return to Texas. A change of plans took John on to California with Hays, but David returned to Texas. He traveled down the Mexican side of the Rio Grande to Presidio del Norte, where he crossed over to the Texas side and opened a camp to trade with the Mescalero Apaches. Torrey carried on an excellent trade in the camp of some 700 or 800 Apaches, but the friendly disposition of the customers changed without warning when news reached camp that some Apaches had been killed in a brush with Americans traveling to California. David Torrey and all of his companions except one were killed by Apaches on Christmas Day, 1849. Henry C. Armbruster, The Torreys of Texas (Buda, Texas: Citizen Press, 1968). John Henry Brown, History of Texas from 1685 to 1892 (2 vols., St. Louis: Daniell, 1893). Thomas Clarence Richardson, East Texas: Its History and Its Makers (4 vols., New York: Lewis Historical Publishing, 1940). John K. Strecker, Chronicles of George Barnard (Baylor University Bulletin, September 1928; rpt., Waco Heritage and History, Fall 1971). Amelia W. Williams and Eugene C. Barker, eds., The Writings of Sam Houston, 1813–1863 (8 vols., Austin: University of Texas Press, 1938–43; rpt., Austin and New York: Pemberton Press, 1970). Dorman H. Winfrey and James M. Day, eds., Texas Indian Papers (4 vols., Austin: Texas State Library, 1959–61; rpt., 5 vols., Austin: Pemberton Press, 1966). Handbook of Texas Online, Henry C. Armbruster, "TORREY, DAVID KILBURN," accessed April 23, 2019, http://www.tshaonline.org/handbook/online/articles/fto21.